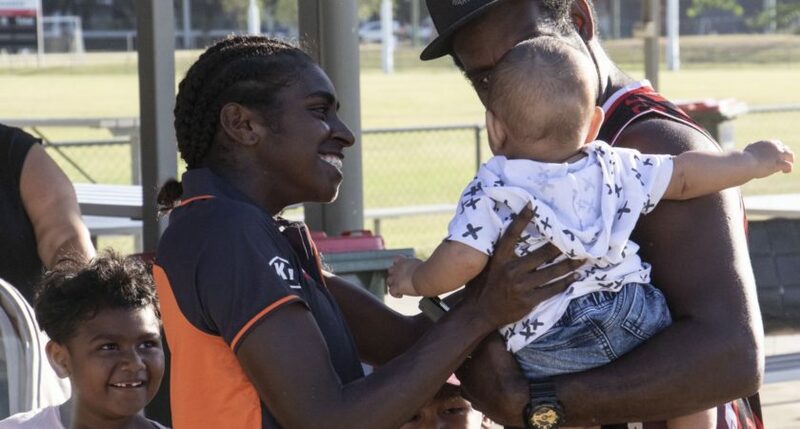 Less than five months ago, GWS Giants speedster Delma Gisu was crowned a QAFLW champion as a member of the premiership winning Wilston Grange Gorillas at Leyshon Park. On Saturday, Gisu added another achievement to her footballing resume at the same venue as she helped steer the GIANTS to a convincing X-point win over the home-team Brisbane Lions in the AFL Women’s practice game. The GIANTS outmuscled the Lions through the midfield, but it was inside 50 were the travellers inflicted the most damage as they piled on 11 goals to four. Speaking after the game, Queensland native Gisu was pleased to have gotten her first game in orange and charcoal out of the way and was happy to have played the game back home. “I was a bit nervous running out on the field, but it was good to play in the colours for the first time,” Gisu told aflq.com.au. Along with fellow Queenslander Erica Fowler, who was selected by Collingwood as a prelisted compensation player, Gisu was one of a few Queenslanders to be drafted interstate during the AFL Women’s draft. So now, for the first portion of the 2019 calendar year, Gisu will call Western Sydney her home. But according to the livewire, her new GIANTS teammates are already home. “It’s really good. The girls at the club really are family and it’s a multicultural club so I love it,” she said. Following the game, Gisu was able to catch up with family and friends who had travelled to see her play once again. And with Round 1 of the new AFLW season fast approaching, they won’t have to wait much longer to see Gisu in action. Greater Western Sydney will once again travel to Brisbane to face the Lions in Round 1 at Moreton Bay Central Sports Complex.